The method used for tracking the progress of individual workflows in the Goobi process list has proven invaluable over the years. 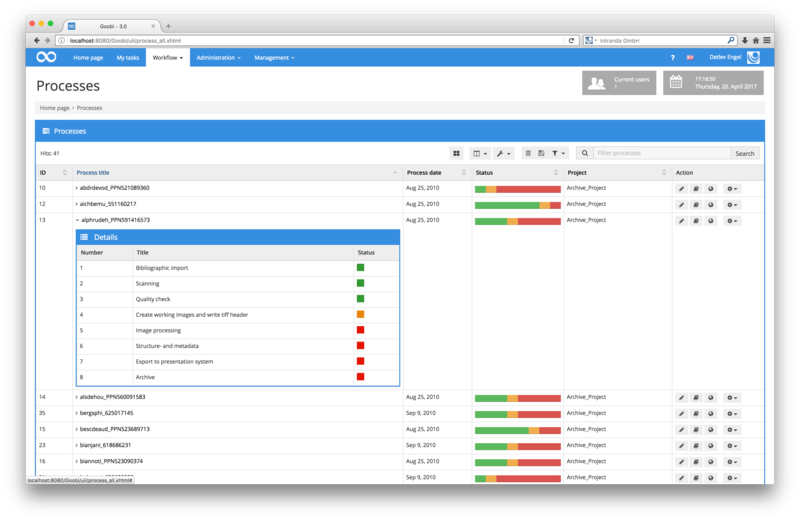 The progress bar (based on three colours to indicate the status of each workflow step) provides an effective and above all a rapid overview. At present, if you want to know more, you can simply click on the process title and examine the precise status of an object. What’s more, you can always display additional columns in the table if you want to view more details such as the date the process was created or batch attributions. As Goobi has become more popular over the years, the demands made on the program have increased. 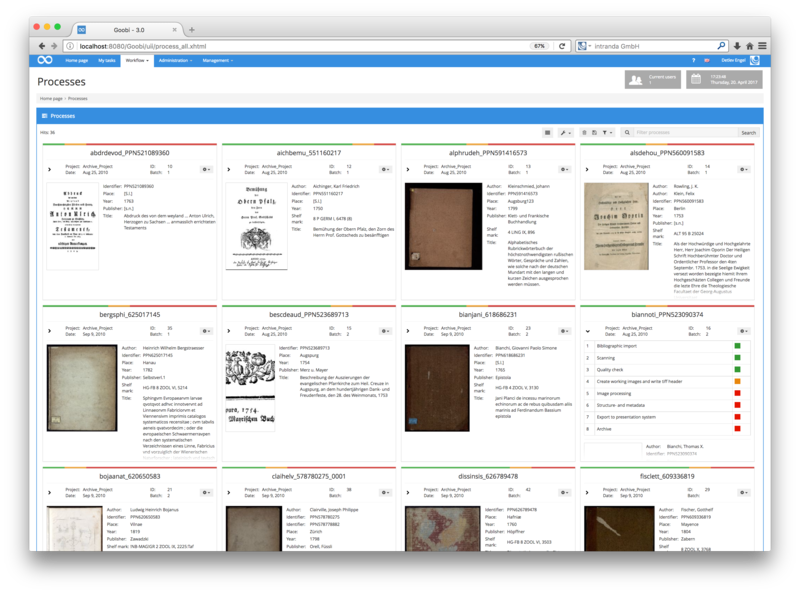 Museum-based users in particular have contacted us to say they would ideally like an even simpler way of navigating to the object image and metadata. 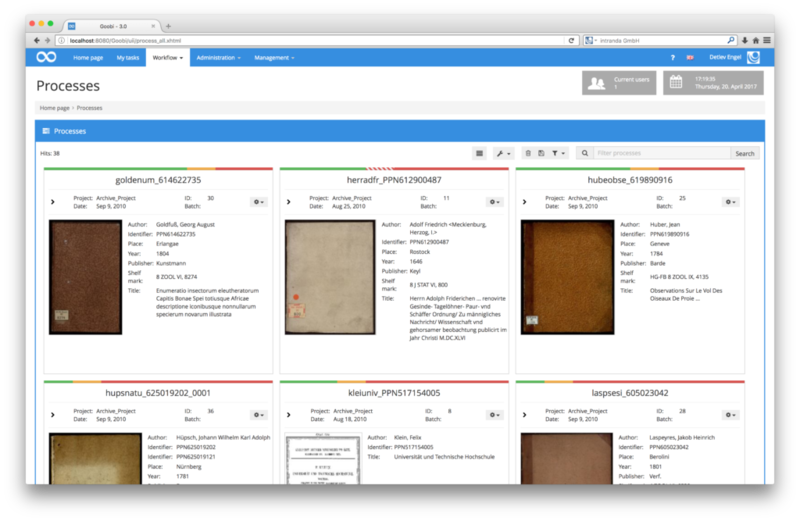 This could have significant benefits for those working with objects for which very few digitised resources are available. In response, we looked at whether it was possible to introduce a new feature in this area. Alongside the existing display showing the various workflow processes, Goobi 3.0 will now include an option to display a preview directly in the process list. As usual, the progress bar, some process and project details and all the permitted actions will be shown for each object. In Goobi 3.0, however, each object will also be accompanied throughout by a preview image and various metadata. The image shown will be the representative image, or (if a representative image has not been specified) the first available digitised image. If you want to see more of the object, you can magnify it simply by moving the mouse pointer over the image. If you click on the arrow icon, Goobi will reveal additional information about the status of the workflow. As before, if you want to view detailed metadata, you can also launch the Goobi Metadata Editor directly from this point. These additional process display features will be available in Goobi 3.0. Provisional launch date for Goobi 3.0: end of May 2017.